My family and I love to camp…it is always fun to pack up our gear, put up a tent and rough it for a few days in the woods! I haven’t really spent too much time in the last 10 years investing in the right gear for our travel adventures, though. We have an odd assortment of packs and bags that we usually bring with us…some we like but others really just don’t make the cut. I don’t want a suitcase with wheels out in the woods nor do I want a plain duffel bag with no pockets for flashlights and bug spray. I was looking for something in the MIDDLE. Good adventure gear that would hold up to being thrown onto a fallen log but that had lots of little places to store things like pocket knives and water bottles! 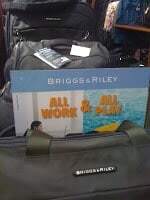 Briggs and Riley is a very well known luggage manufacturer with a new line of adventure gear called BRX. Once I checked out all the pieces that they spotlight on their website, my search for the perfect piece of gear took me to their store locator first. I was a little surprised to find that in the huge metro area I live in, the only place I could find the BRX line was at Mori Luggage & Gifts. 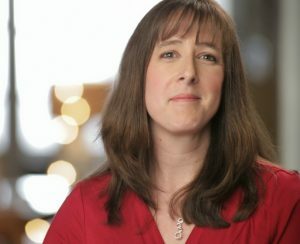 I have some pretty big outdoor retailers near me like REI and Dicks Sporting Goods but neither one of those stores carried ANY Briggs and Riley luggage! I called the Mori Luggage & Gifts that the store locator said was the closest but they don’t carry the BRX adventure gear…GRRR! I called the NEXT closest one and lucked out….it was a 35 minute drive but I really wanted to check out this gear! 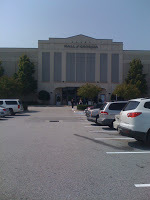 I headed off to the mall to find the store I needed. Thanks heavens for that mall map because this place is HUGE! 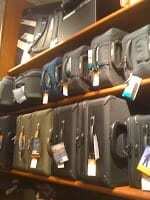 Once at Mori Luggage & Gifts I saw all sorts of Briggs and Riley luggage from all their different lines. 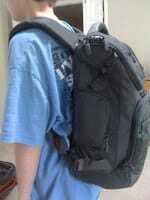 I browsed around for quite a while looking at the backpack, toiletry kit, wheeled suitcases, and duffel bags although I didn’t spot the messenger bags or field bags listed on their site. There were plenty of signs up to show off all the BRX pieces and the staff at the store was amazingly helpful! When I finally decided on the duffel bag and excursion backpack the wonderful sales person was eager to show me all the great features each one had. She also told me that the BRX gear has a LIFETIME warranty! How amazing is that? My gear takes a bit of a beating while I am camping so it is great to know that it is protected with a warranty! The BRX site shows the pieces in 3 colors (blue, grey and tan) but the only one I saw was the grey accept for ONE piece of the blue but that was fine with me because I wanted the grey anyhow! The store employee did say that if there was a certain piece I wanted that they would see if they could order it for me. I thought that was very helpful. After I made my choice I had a very speedy checkout, and headed home to start making my list of things to pack! Who knew camping for 2 days required quite so much STUFF, right? 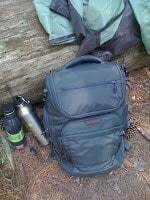 The excursion backpack was for my son to use and it was perfect for our 2 day journey…just enough room for clothes, toiletries, flashlight, water bottle, leatherman knife, and a pair of flip flops for lounging around. Now, we do car camping so all the big stuff is in the back of the truck…tent, sleeping bag, food, camp stove, etc. 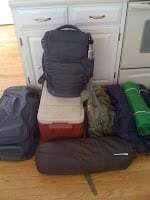 This pack is more like just his personal stuff that will go in the tent with him…or if you were just doing some day hiking and wanted to pack a sweatshirt, emergency gear and food for the day it would work for that too. The duffel bag was for my husband and I to share and it was the perfect size for 2 people for 2 days. There are a TON of extra pockets all over it for things like flashlights, first aid kit, etc. I hate when I put something small into a duffel and it disappears! Nothing can get lost in this bag! And the really awesome thing about it is that there is a panel on the bottom that unzips and out come the shoulder straps so you can put the bag on your back! This is truly a unique feature and even if you are going on an airplane journey and not camping, this would come in really handy! This bag also has straps to attach it to their wheeled suitcase if you decide to purchase one of those, too! We had a ton of fun on our camping trip, even though we got stuck in the tent for a couple of hours due to the rain. Our tent floor ended up a little damp but everything inside the duffel stayed nice and dry. I was impressed! The backpack got thrown around in the dirt and tossed into the truck and stayed really clean. This material really brushes off the dirt pretty well and the color really hides quite a bit. Everything stayed put inside and no zippers got stuck. REI and Dicks Sporting Goods so I don’t have to drive quite so far when I treat myself to that messenger bag I have my eye on! If you want to know more about Briggs and Riley, you can check them out on Facebook and Twitter! Check out This Moment for a closer look at my experience! Disclaimer: This shop has been compensated as part of a social shopper insights study for Collective Bias. All opinions expressed here are mine and mine alone. Looks like great gear for our next camping trip! Wow, I didn't see the backpack when I went shopping for my bag. That's a great addition. Thanks for letting me know about it.